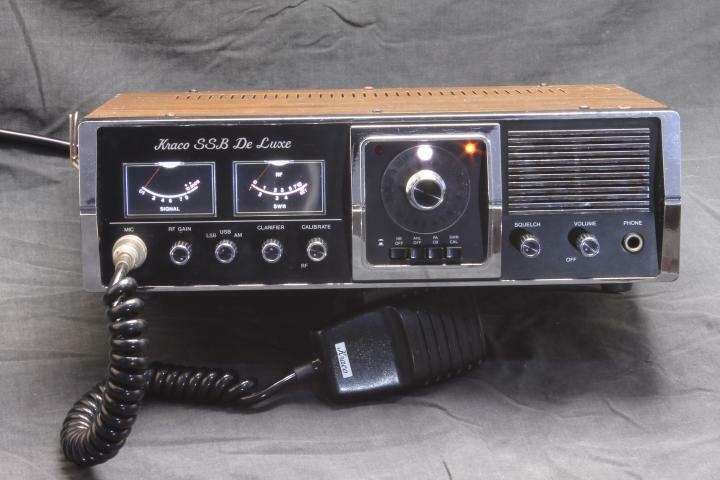 Found another excuse to play, this time a conversion to a Kraco SSB crystal synth radio from 1976. The owner of the Super Stat 3900 in the previous thread bought this one from a deceased estate. Normally these need a lot of work to restore but this one was in really nice condition and still with the original box, microphone, and accessories. One control (AM/USB/LSB) was a bit noisy and the meter lights were very dim. No sign of the years on the front panel and only slight darkening of the cadmium plating on the rear. The radio had been converted to the local 240V mains voltage presumably before it was sold as new, but the original 2 wire mains cable and plug had been retained. This is illegal and dangerous with the Australian mains wiring scheme - basically a single 240V active comes into the house and the return is a outside ground stake - so any short / insulation breakdown on the primary side of the radio will mean the case becomes 240V above earth and could deliver a nasty or even fatal shock. Any 240V device here with an exposed metal surface has to have a 3 wire cord, the 3rd pin connected to any metal surface and going via a separate safety earth wire to the houses ground stake. I'm pretty sure it's the same in the UK, so just added that bit for anyone reading from the other side of the Atlantic. Apart from the mains cable, meter lighting, and a bit of Deoxit, there was no other work needed apart from the channel conversion. The owner was very particular he wanted the radio to retain its original appearance. He agreed to allow a single button (the NB was used) for channels 24 to 40. The frequency readout and additional channels above and below the normal 40 was to be plug in, originally he wanted something like the old Digiscan UFO expanders from the early 80's. Making one of these as a one off would have been very expensive , so a cheaper alternative was required. 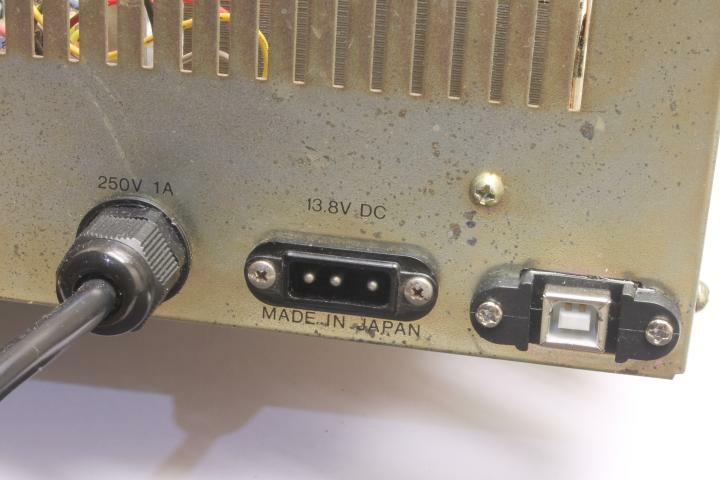 The controller board used in the 3900 drift fix has a USB port on it, so a virtual VFO laptop app was decided on for the uppers, downers, and in betweens - no parts required other than a standard printer type USB cable. He also wanted it drift free like the Ranger Superstar conversion done last month. This was achievable because it was going to use the same synthesizer as that radio, and it in theory should be better as we wouldn't have the 4 Hz drift from that radios 10.240 crystal to contend with. 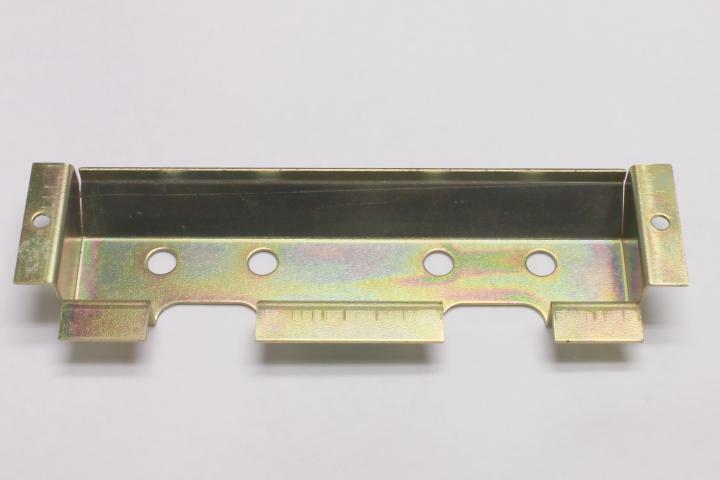 This one should be stable to between 1 and 2 hertz, plenty good enough for SSB voice communications. At this point it was reassembled and aligned. 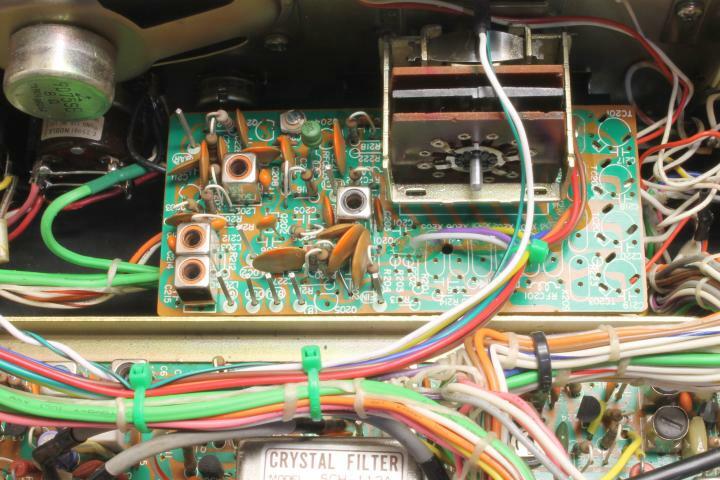 The old crystal synth was all over the place frequency wise, but the rest of the radio worked as good as new. It took a little while to work out the old crystal synthesizer scheme. 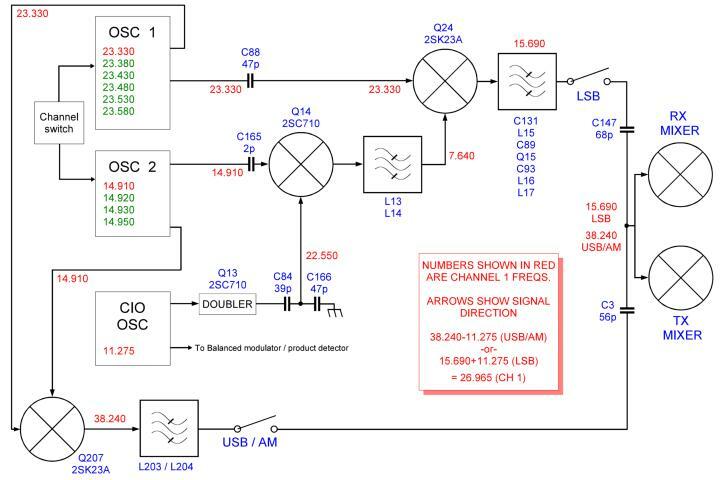 With nearly all SSB radios, there is a carrier oscillator near the radios first IF frequency that is shifted slightly to switch between USB and LSB. The Cobra / Washington radios with the single conversion MB8719 chassis, as an example, use 7.7975 and 7.8025 MHz crystals for this. This saves the need for a much more expensive second crystal filter for each sideband. The Rangers and later Unidens use 10.6925 and 10.6975 MHz to achieve the same thing. The Kraco used a single filter as expected, but the carrier oscillator was 11.275 MHz on both USB and LSB. How could they do that? Turns out they used a third method. By using a complex mixing scheme they used low side local oscillator injection on LSB, and high side injection of USB. This causes a frequency inversion (as the frequency direction between the received frequency and the radios radios first IF frequency is reversed) and allows the radio to decode each sideband correctly. 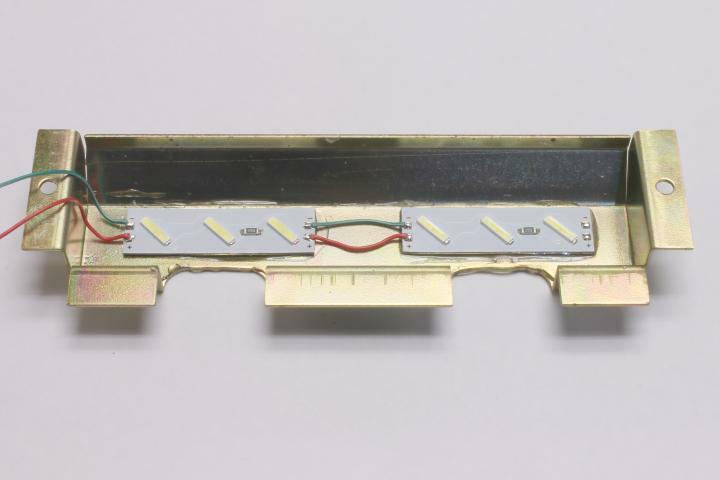 For LSB, the 11.275 MHz carrier oscillator is doubled to 22.550 MHz and mixed with the 14.91 crystal to give 7.640 MHz. 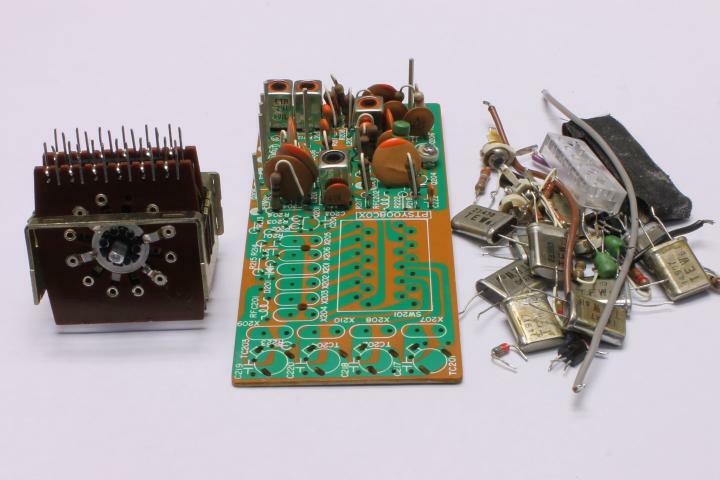 This is mixed with the 11.275 MHz carrier oscillator on transmit to give a sum frequency of 26.965 MHz, FCC channel 1.
crystal filter and mixes with 11.275 MHz the carrier oscillator to decodes the signal back to baseband audio as per USB. is centered on the incoming carrier frequency, and the carrier oscillator is turned off so it doesn't swamp the incoming signal. By switching in combinations of 10 crystals, any one of 24 channels (the circuit uses a 6 x 4 matrix) can be synthesized. To replace the scheme with a modern PLL, we decided to use low side injection only, which would improve the stability a bit. This meas having to replace the 11.275 oscillator with the second output of the Silabs synth board so we could change it between 11.275 and 11.271 to switch between USB and LSB. 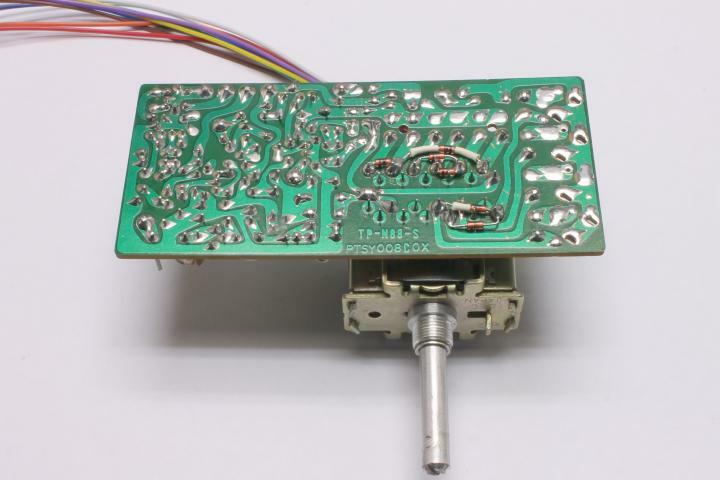 The first output was used to generate the 15 MHz local oscillator directly. Part of the LSB filtering was retained to keep the LO signal as clean as possible. Spectral purity of the new LO was plenty good enough, just some low level spurs 2 MHz away @ -60dB. Why not just output the 2 crystal frequencies directly and retain all the original mixers? That LSB filter is tight for a reason. It has to pass 15.7 to 16.0 MHz signal while rejecting remnants of 14.91 MHz (from the fitst crystal bank) and 15.28 MHz (second harmonic of the Q14 mixer which was only 18dB down after passing through L13 and L14). This is a tall ask for an LC filter that only just scrapes though in 23 channel form. 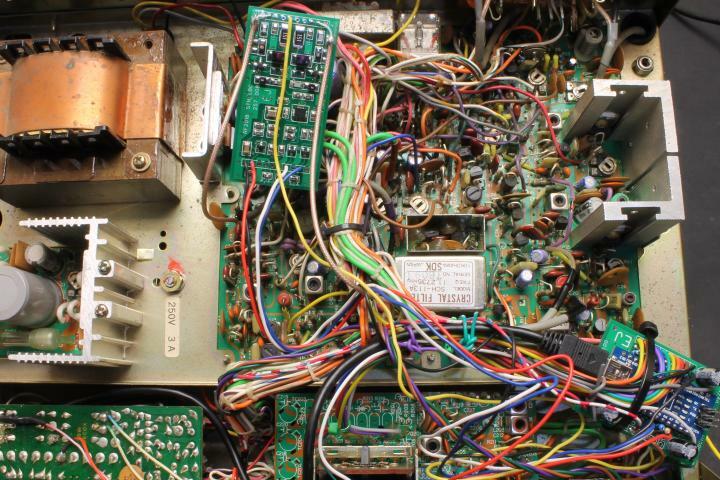 Expanding the radio to 1MHz or more wide is going to asking a bit much of it. By not using the original mixers, there were no unwanted mixing products to deal with. We didn't have quite enough inputs of the control board, do we uses a few diodes on the channel switch to save some input lines. 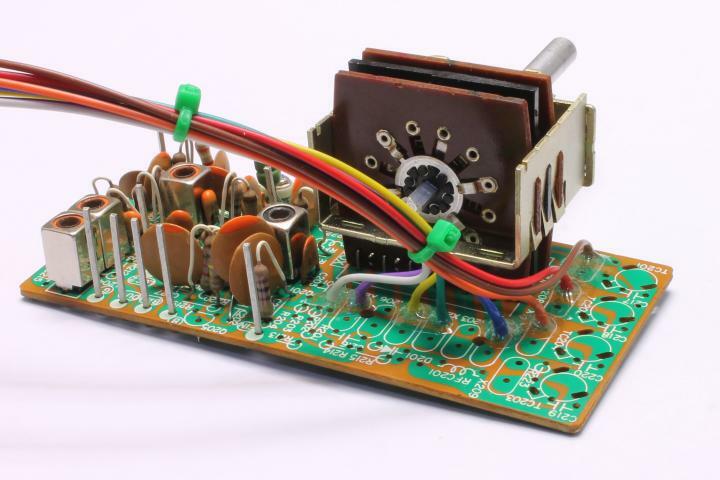 The clarifier voltage was fed into one of the analog inputs on the controller board. Wires fitted to where the crystals used to go. 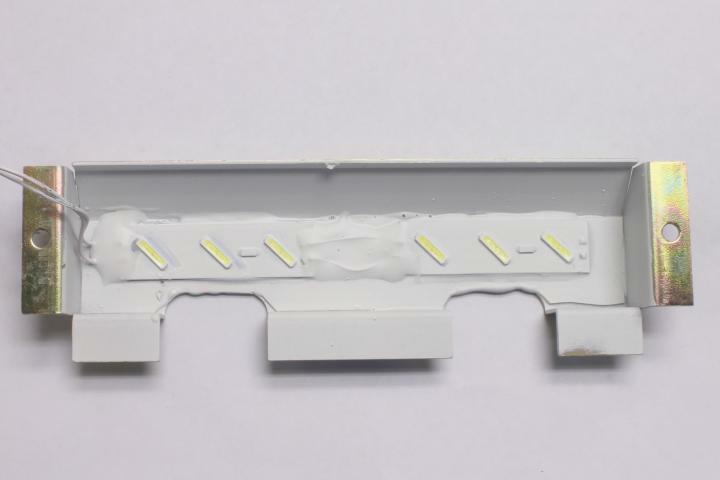 The components on the left are no longer connected to anything. Modified channel board refitted to radio. The new synth and controller boards loosely fitted so the boards can be tested for correct operation. These were heat-shrunk and secured when all all was confirmed operating correctly. The remote PC application screen. The left one is in "Frequency counter" mode, it just shows the radios operating frequency. In this mode, the channel light on the radio is on, and the clarifier is receive only. Radio was stable to about 1.5 Hz. 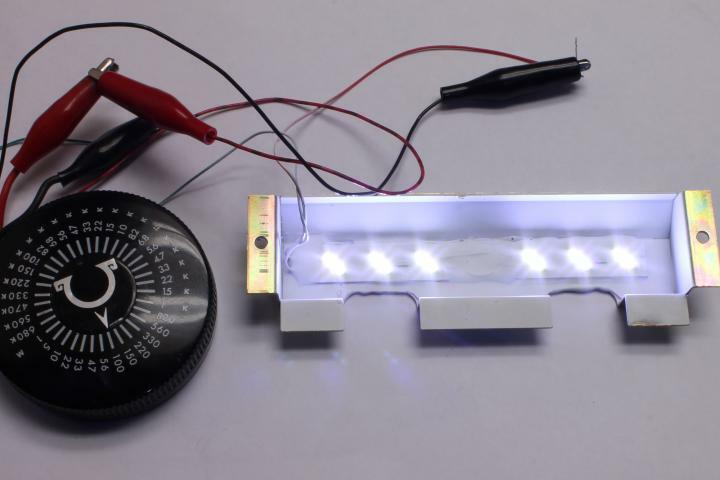 The display tracks the clarifier, and reads the correct frequency on AM, USB, and LSB. The right one is the app in VFO mode. The radio tunes from 26.800 to 28.000 MHz in either 10KHz, 5KHz, or 1KHz steps. In this mode, the channel light on the radio is turned off, and the clarifier is unlocked. There are 5 presets for the most commonly used channels here in Oz. 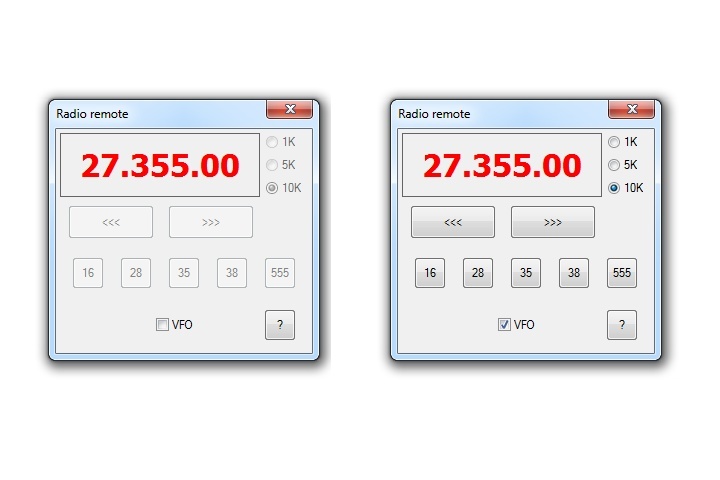 By clicking a check mark in the VFO box, the radio can be easily switched over. Pulling out the USB cable turns the channel light on the radio on and the radio works as a standard 40 channel set. Waited off on posting this one until the owner had used it for a week to confirm all is OK.
Im speechless What happened to the vintage 80's spider? Great post though (to those who understand what you're going on about), very informative with great pic's too. Keep up the good (and complicated) work! 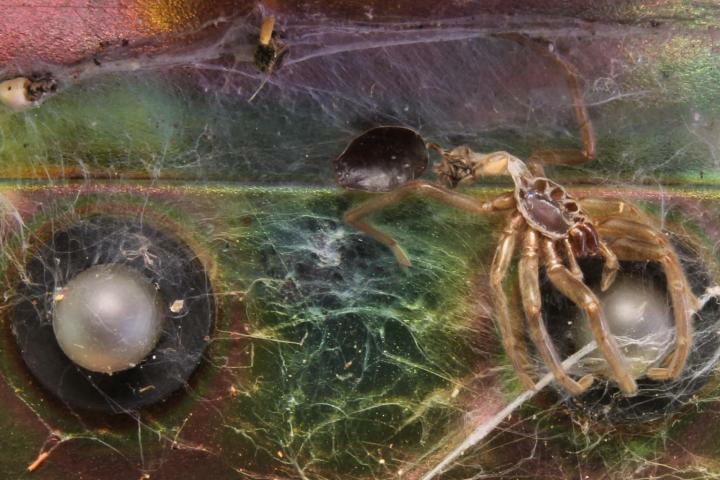 But twas only a baby spider, in Awestralia there be monster spiders, I knows I've seen em.